The Spanish Cat is our top choice. An international school with local expertise. It is actually in Tepoztlan which is across the valley about 20 minutes away. The murals were commissioned by Dwight Morrow, U.S. ambassador to Mexico from 1927 to 1930. 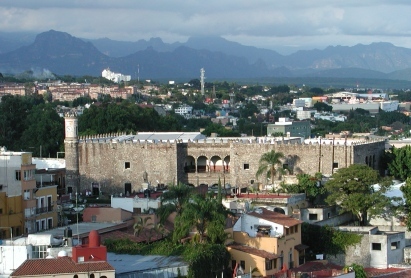 It was in Cuernavaca where Marrow's daughter met her future husband and later became Mrs. Charles Lindbergh. 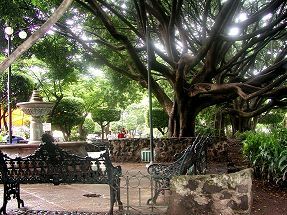 It is worth a visit to the zocolo near sunset to hear the amazing sound of thousands of birds rousting in the large trees surrounding the square. It is nearly deafening! Close to the zocolo is also a museum called the Robert Brady Museum which has a nice collection of art and folk art collected by Robert Brady who used to own the lovely house that is the museum. Not far from the downtown area is the central market which is worth a look, easy walking distance and in the opposite direction on the other end of the zocolo is the old Cathedral and a place called Jardin Borda which is a museum and grounds that was built by an architect named Borda for the famous couple Maximiliano and Carlota. The gardens there are worth a look and free on Sundays.